Reel in the perfect marshmallow or hot dog! It’s easy and fun with the Reel Roaster. Simply place a marshmallow or 2 - or even a hot dog - on the telescopic skewer. Then crank the handle on the fishing reel. 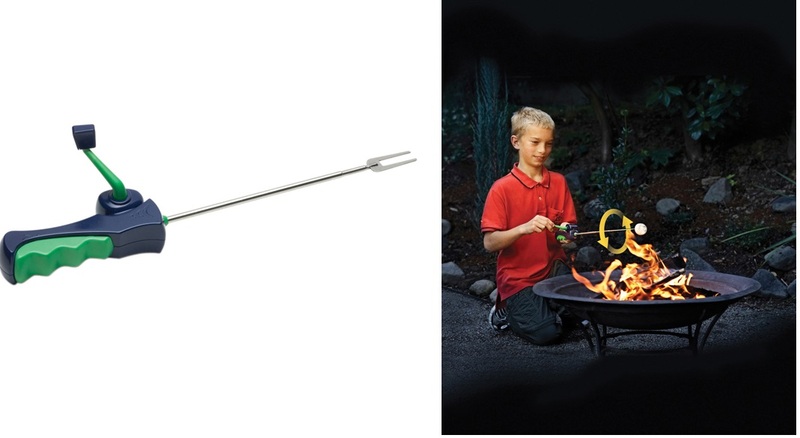 This rotates the skewer and ensures that the marshmallow or hot dog is cooked to perfection. Go for a slow turn, slow roast. Or crank up the speed for a faster rotation. Either way, it’s going to be a hot and delicious treat. Hand crank fishing reel – Crank the handle and the skewer automatically rotates the marshmallow or hot dog. 27” telescopic stainless steel skewer – You control the desired length from fire. Detachable skewer – Makes clean up fast and easy. Great fun for camping, cookouts and backyard barbecues – Ideal for kids and adults.